Posted on Mon, Jan 23, 2012 : 3:43 p.m. There's a chance the Michigan basketball frontcourt could get a boost Tuesday at Purdue. Michigan coach John Beilein said Monday that injured sophomore forward Jon Horford will travel to Purdue (Tuesday, 7 p.m., ESPN) and has a chance to dress and play in the game. "He's going to travel with us, he's practiced the last couple days and has been a little rusty, as you would expect," Beilein said Monday. "We'll continue to monitor him and see what he does. He has a good scout team workout today, and before we do anything he's got to show in practice that he's really playing the best he can play." Jon Horford has missed the last 11 games. The 6-foot-10, 250-pound sophomore has missed Michigan's past 11 games after suffering a stress fracture in his right foot. He returned to practice last week, but did not make the trip to Arkansas on Saturday, instead remaining in Ann Arbor for additional treatment. Beilein wasn't clear one way or another on Horford's chances of playing Tuesday, just saying it's possible. 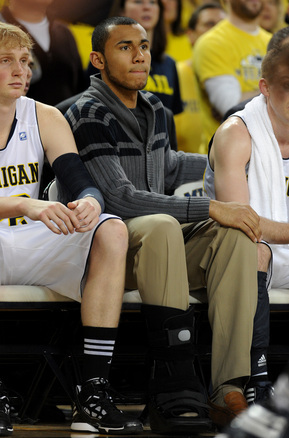 "Yeah," Beilein said when asked if there was a chance of Horford dressing or playing Tuesday. "He may." Currently eligible for a medical redshirt, Horford has averaged 2.7 points and 3.6 rebounds in nine appearances this season. After traveling to Purdue on Tuesday, No. 20 Michigan (15-5, 5-2 Big Ten) will visit Ohio State on Sunday. Want to stay connected to Wolverine basketball in your Facebook newsfeed? “Like” AnnArbor.com's Michigan Basketball News & Views. Also, do it by Jan. 29 for a chance for 4 tickets to the Ohio State at Michigan game on Feb. 18.